TACKI President Jay Critchley launched his corporation in order to develop a global folk art movement and cottage industry, promote awareness of these elegant throwaway objects washed up on beaches worldwide from faulty sewage systems, create the world’s largest collection of discarded plastic tampon applicators, and ban their manufacture and sale through legislative action. The mission’s global ambassador is Miss Tampon Liberty, aka Jay Critchley, who wears a gown of 3,000 beach whistles when taking her message to: the Massachusetts State Legislature; Liberty State Park for the Centennial of the Statue of Liberty; the No With The Flow protest of the Boston Sewage Outfall Pipe; and numerous site-specific performances and installations. Miss Tampon Liberty was also featured in the documentary Under Wraps, screened at the Margaret Mead Film Festival at the American Museum of Natural History in New York. No with the Flow, was a ceremony/protest to mark the opening of the 9.5 mile Boston Sewage Out Fall Pipe into Massachusetts Bay, spewing 360,000,000 gallons of effluent per day into Provincetown Harbor. Miss Tampon Liberty's gown (circa 1985) is made of 3,000 “beach whistles”, mixed media. Performed at Race Point Beach, Cape Cod National Seashore, Provincetown, MA. The artist performed “I’m Miss Tampon Liberty,” with dance, 2000. “The Pilgrims were not the first visitors to the Cape tip and they won’t be the last – as long as we have “beach whistles” visiting our shores. And they add a feminine touch to the festivities,” states artist Jay Critchley. The Tamponument postcard is modeled after one from the antique postcard collection of Dan Towler. 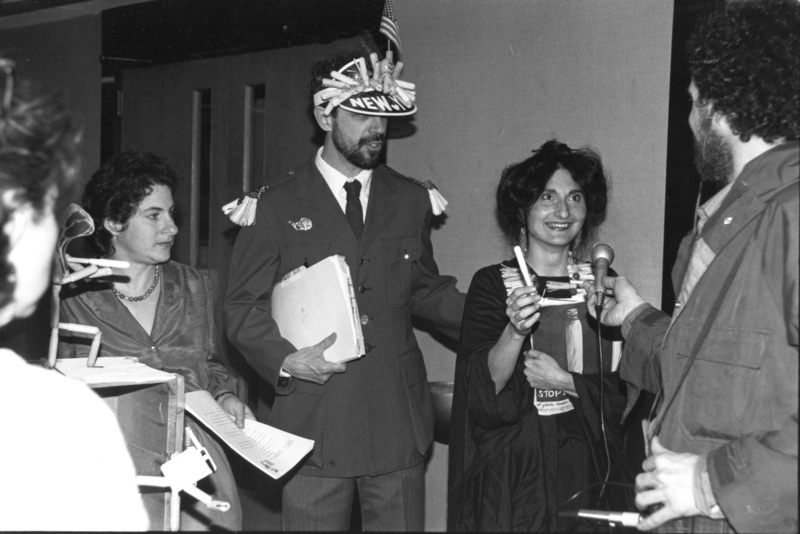 “Bella Abzug Modeling Tampon Applicator Hat” made by Jay Critchley, circa 1992. Photo Credit: Chris McCallan, 2009. Environmental activists and artist Jay Critchley was commissioned by Adrienne Scott and Liz Armstrong, Canadian menstrual activists (and authors of the 1992 book Whitewash: exposing the health and environmental dangers of women’s sanitary products and disposable diapers : What you can do about it) to create this amazing hat to generate awareness about the tremendous waste produced by single use FemCare products (they also fashioned a menstrual pad costume (with wings!) and wore it during protests). ​Kudos to the legendary Bella Abzug for agreeing to model it in this photo shoot! New Blood offers a fresh interdisciplinary look at feminism-in-flux. For over three decades, menstrual activists have questioned the safety and necessity of feminine care products while contesting menstruation as a deeply entrenched taboo. Chris Bobel shows how a little-known yet enduring force in the feminist health, environmental, and consumer rights movements lays bare tensions between second- and third-wave feminisms and reveals a complicated story of continuity and change within the women’s movement. Through her critical ethnographic lens, Bobel focuses on debates central to feminist thought (including the utility of the category “gender”) and challenges to building an inclusive feminist movement. Filled with personal narratives, playful visuals, and original humor, New Blood reveals middle-aged progressives communing in Red Tents, urban punks and artists “culture jamming” commercial menstrual products in their zines and sketch comedy, queer anarchists practicing DIY health care, African American health educators espousing “holistic womb health,” and hopeful mothers refusing to pass on the shame to their pubescent daughters. With verve and conviction, Bobel illuminates today’s feminism-on-the-ground—indisputably vibrant, contentious, and ever-dynamic.